The elephant’s life span is three hundred years. They travel in herds, are afraid of mice, and courteously salute men in whatever way they can. They once lived in both in Africa and India, but now only live in India. 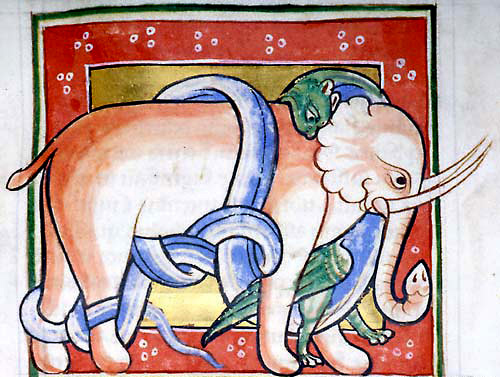 The dragon is the enemy of the elephant, and hides near paths where elephants walk so that it can catch them with its tail and kill them by suffocation. ... When it is time to give birth, the female wades into a pool up to her belly and gives birth there. 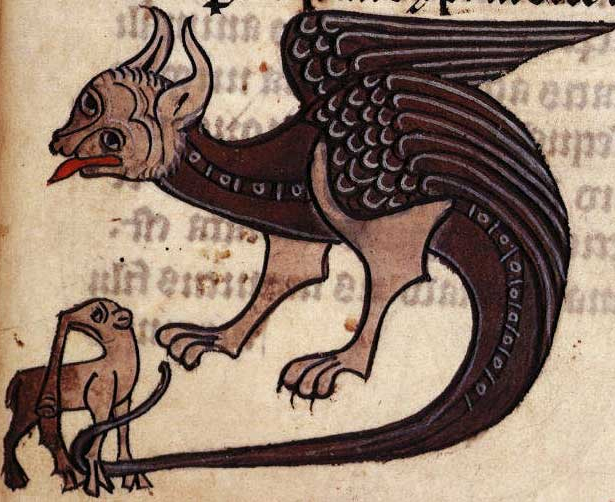 If she gave birth on land, the elephant's enemy the dragon would devour the baby. 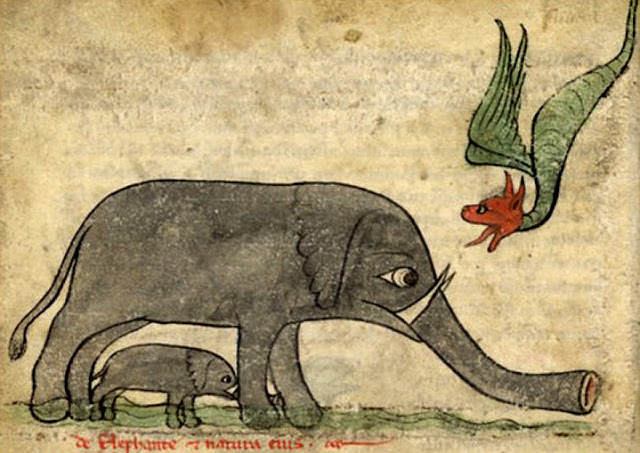 To make sure the dragon cannot attack, the male elephant stands guard and tramples the dragon if it approaches the pool. 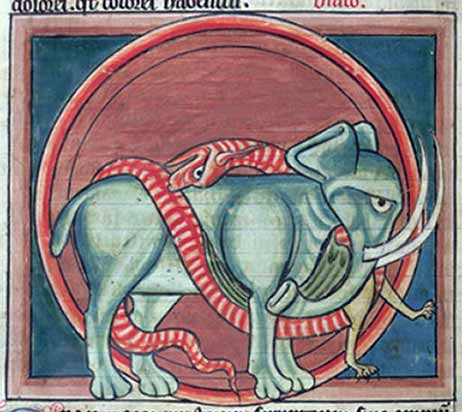 The elephant and its mate represent Adam and Eve. 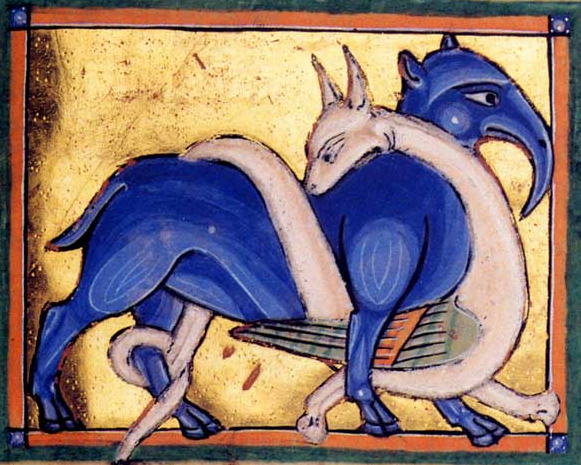 When they were still without sin in the Garden of Eden, they did not mate, but when the dragon seduced them and Eve ate the fruit of the tree and gave some to Adam, they were forced to leave Paradise and enter the world, which was like a turbulent lake of pleasures and passions. 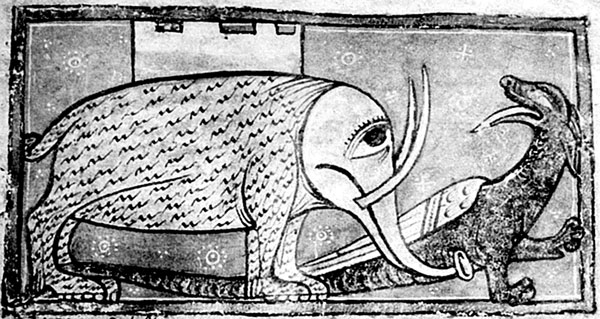 The elephants mated and she conceived, and “gave birth on the waters of guilt.” The big elephant represents the law, which could not raise up mankind from sin, nor could the twelve elephants, which represent the prophets. Christ is the small elephant who succeeded to raising the fallen. The burning skin and bones of the elephant represent the commandments of God, which allow nothing evil to enter the pure soul. So there you go: perfectly sensible. 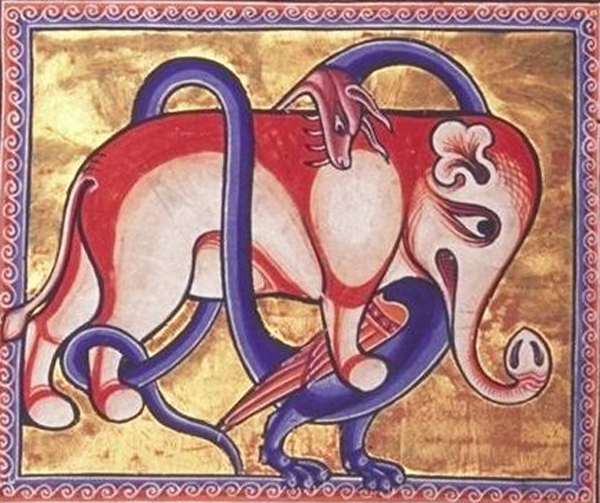 In closing, I want to say that I really hope some fourth-grader researching elephants stumbles onto this blog post and presents all this information to his class. This was very interesting, but there's this tiny bit that puzzles me: "The elephant’s life span is three hundred years." No clue where it came from. Honestly, to me, that doesn't seem any more out-of-nowhere than any other "fact" presented about elephants. But given the time period we're talking about, I'm going to guess that this belief arose out of religion-rooted superstition. 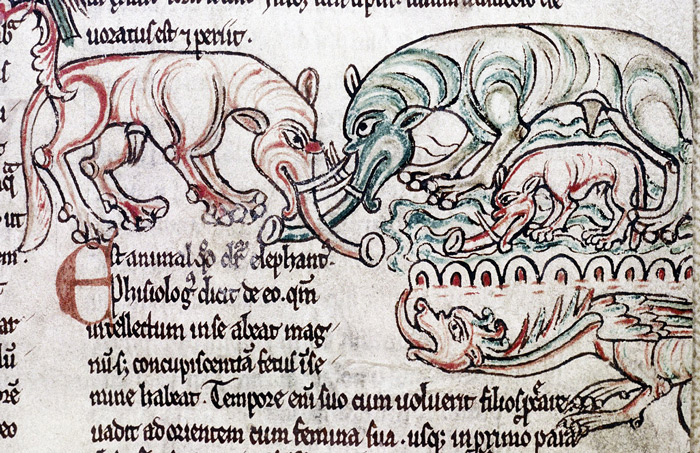 I guess people tended to think any big animal would have an extra-long lifespan. Which makes sense, I guess? Of course, that too is interesting when you consider how, like, Great Danes live much shorter lives than Chihuahuas on average, because it's hard for an animal's circulatory system to pump blood through a body that's much bigger than it's evolutionarily prepared to service. That's because dogs aren't naturally that big. They have been bread by humans to be that big, and the selective inbreeding involved also happens to affect their circulatory system (particularly the size of their heart). Each breed tends to have their own issues. So, while chihuahuas might have longer life spans, they also tend to have anxiety issues and develop bladder problems as they age. Elephants, whales, etc., on the other hand, are not generally inbred to achieve an "unnatural" size, so they tend to live longer, while smaller species that breed in the wild tend to have shorter life spans (there are, obviously, many exceptions to this, such as certain parrots which can live to 90+ years). This is also probably why "mutts" tend to live longer than "pure-breds."